A fun and useful recreational map to skiing, biking and hiking trails in the Franconia, New Hamsphire, region. Outstanding recreational trail map to hiking, biking and skiing in central Vermont's beautiful Mad River Valley, incuding the Long Trail and Camel's Hump. A handy, pocket-sized guidebook to the best mountain biking adventures in the western White Mountains of New Hampshire. An easy-to-carry guide to the best bicycling in New Hampshire. A new updated and revised guide to the best hiking, biking and paddling excursions in Maine's Acadia National Park. A new family-oriented guidebook to more than 75 family hiking, camping, biking, and paddling trips in northern New England. A fine guidebook to 40 of the best bike rides in New Hampshire, Vermont and Maine. Great waterproof trail map to hiking and biking paths in the Canden Hills region of coastal Maine. Great new waterproof adventure map to the southern Maine Coast, from Old Orchard Beach to Kittery. 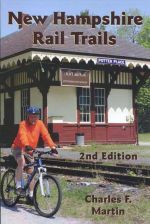 Second edition of the author's popular bicycling guide to the White Mountains.